This HW30 multi-function stopwatch displays a digital up/down timer, temperature, humidity and heat index. The heat index measurement shows how hot it feels when humidity is combined with the actual temperature. Ideal for use in hot weather conditions. Additional features include a 12/24-hour clock, stopwatch, 30 lap/split memory and programmable alarm. 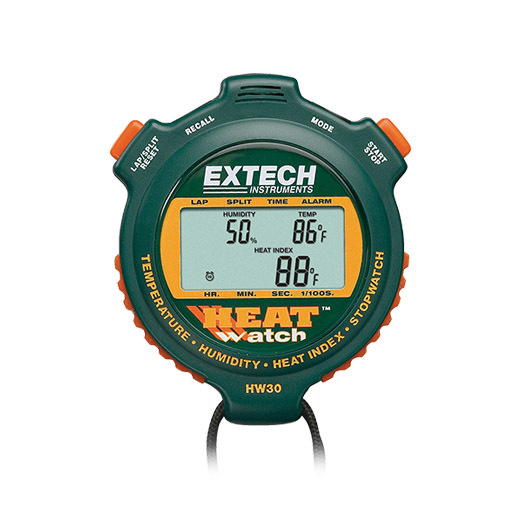 HW30 Humidity/Temperature HeatWatch comes with lanyard, battery, and operating instructions.